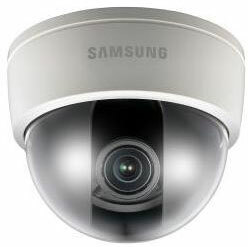 The Samsung SND-1080 is a discreet general purpose VGA network dome camera suitable for a wide range of internal applications. With the Samsung Techwin WiseNetS DSP chipset at its core, which delivers a host of advanced features including face detection analytics, third generation Samsung Super Noise Reduction (SSNRIII) to eliminate image noise in low light conditions, and Samsung Super Dynamic Range (SSDR), it has an analogue video output port enabling conventional analogue control device to make set-up on-site easy. Its compact design makes the SND-1080 especially suitable for small applications such as convenience stores and retail shops.